The Clients tab shows information about clients that have been using the cluster. A wide variety of statistics can be shown, filtered by the control choices in the top of the table view. Leave the Auto-refresh option selected to continually update the data shown in the table. Drop-down menu selectors at the top left of the clients tab control the data in the table. The Source (1), Show (2), and Type (3) options determine which clients and what statistics are shown. The Source selector (labeled 1 in the screenshot above) determines the scope of the clients shown. You can select any of the cluster’s vservers, core filers, and nodes. If a vserver is selected, clients attached to that vserver are listed. If a core filer is selected, clients attached to that core filer through the Avere cluster are listed. If a node is selected, clients connecting through that node are listed. After selecting the source, you can select which subset of clients to view by using the Show control (2). The options in the Show selector depend on what is selected in the Source setting. These options appear on the Show menu when a vserver is selected on the Source menu. VServer Connection Information – This filter shows active clients for the vserver, but also includes statistics about how the client is connected to the vserver. 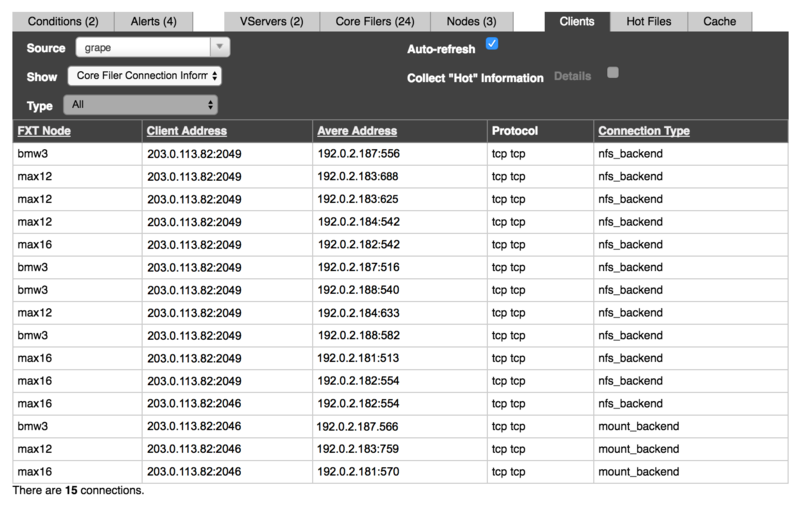 Hot Clients – If the Collect ‘Hot’ Information checkbox is selected, this view shows data about the most active clients connected to the vserver. Read Hot Clients Reporting for a more complete discussion of this feature. 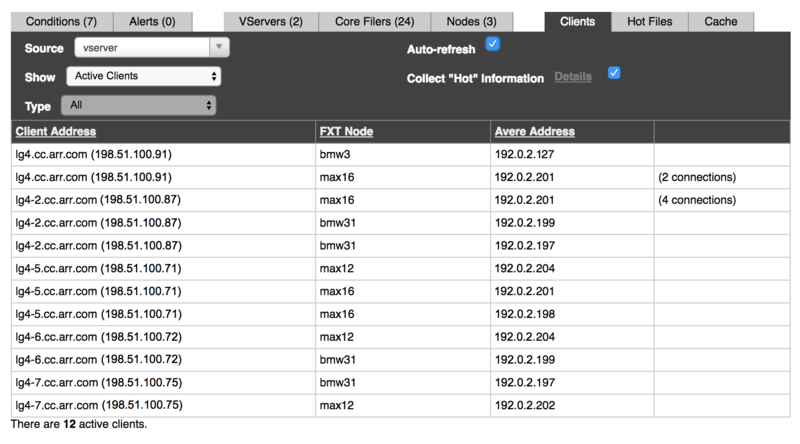 Core Filer Connection Information – This filter shows active clients that are connected to the selected core filer through the Avere cluster. Connection Type – The type of connection between the core filer and the client. The value varies, but common values for a hardware (NAS) core filer include nfs_backend, nlm_backend, or mount_backend. With a cloud core filer, the connection type is typically s3_https_backend or s3_http_backend. VServer Connection Information – Shows specifics about how the active clients are connected to the cluster. Connection Type – The type of connection between the client and the vserver (usually nfs_frontend). Core Filer Connection Information – Shows specifics about client connections to the core filers being used through this cluster node. Each client might have multiple connections to the core filer, so it is possible to have hundreds of connections in this table. Connection Type – The type of connection between the client and the core filer. For a hardware (NAS) core filer, typical values are nfs_backend, nlm_backend, or mount_backend; a cloud core filer frequently has the connection type s3_https_backend or s3_http_backend. The Type selector (3) allows you to filter clients by their connection protocol, SMB or NFS. Currently, this selector is active only for the vserver > hot clients view, described below in Hot Clients Reporting. The Hot Clients view shows usage and activity rate statistics for client machines that are the heaviest users of the Avere cluster. When a vserver is selected as the Source on the clients tab, you can enable or disable hot client data collection and show information about the most active clients in the table. To change the data collection settings, click the Details link to go to the VServer Details settings page, as described below. Collecting hot client information uses CPU and memory resources on the cluster nodes. If you are not actively using this information, you can leave data collection disabled to improve cluster performance. Read VServer > VServer Details in the Avere OS Configuration Guide for more information. To see the most active clients, select a vserver from the Source menu and then select Hot Clients from the Show menu. The hot clients display shows standard client information (node, client address, and Avere cluster address), plus Type, Activity, and Rate. The client type, either SMB or NFS. You can filter by type in the hot clients view – use the Type selector above the table. The Type selector is active only when Hot Clients is selected in the Show control. The total number of operations sent from the client since the cluster started. The activity statistic is reset if the cluster restarts. The current number of operations per second from this client. This value is continuously recalculated; it does not depend on the polling interval. Although the polling interval does not affect the rate and activity statistics, it is used to determine the top n most active clients. When a new poll is done, a client might drop off the hot clients list or be added based on its Activity statistic.